JewlOfTheLotus » My First Tattoo! I finally did it! After 10 years of pondering and planning, I finally got my first tattoo. Surprisingly, after all that planning, I decided on it in a pretty well spur-of-the-moment move. It was the day after Thanksgiving. I went out to Ypsilanti for a late lunch and lo and behold – I found myself eating across the street from Depot Town Tattoo, a shop that had been recommended to me by multiple people. The thought of just walking over there and getting a tattoo immediately crossed my mind, and almost just as quickly, I’d resolved to do it. I’ve been wanting a tattoo for around 10 years now and have toyed with ideas throughout that whole time. This last year, I got serious with it though – setting up multiple pinterest boards with ideas. So, it was decided, I was going to walk across the street after eating and get a tattoo. Step 2: decide which tattoo idea to get. Something simple, something safe, something meaningful, something relevant. Live. Decided. 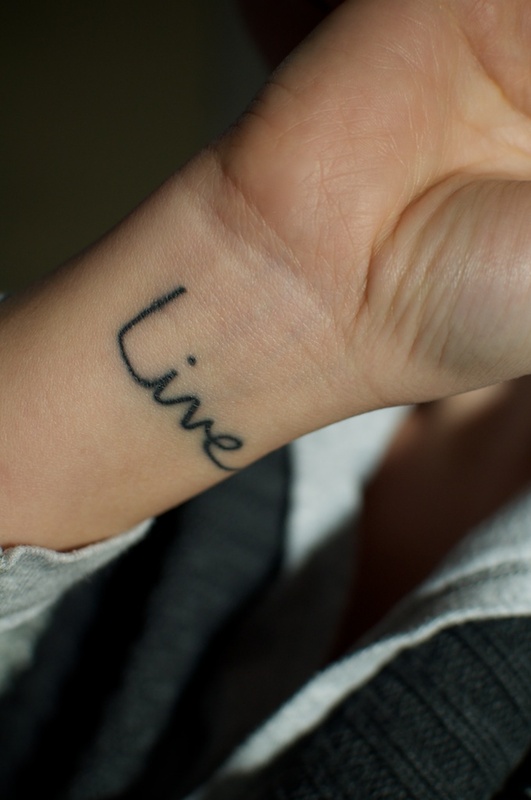 Posted January 1, 2013 at 3:42 pm in Life and tagged 2012, ink, life, live, tattoo. Comments RSS. Post a comment. « We bought a house in Ypsi / Ann Arbor! !